Although they look like simple pieces of bone, your teeth actually have an interesting system just under their surface. Understanding the various parts and functions of your teeth allows you to take better care of them and avoid things like cavities, gum disease, and damage. When you smile, the visible, outer-portion of the tooth you see is called the crown. Most people are familiar with the crown and simply refer to it as their “tooth”; however the crown is only one part of your tooth’s anatomy. The crown is only the part of the tooth that emerges above the gumline. Its shape determines the function of that particular tooth. For instance, incisors, molars, and canines all have different functions based upon their external shape. Within the crown, are enamel, dentin, and pulp. The first, enamel, makes up the tough outer coating responsible from protecting the internal structures. Tooth enamel is comprised of calcium phosphate minerals and is the hardest tissue in the human body. Despite being the hardest tissue, it can still be damaged because it does not contain living cells and cannot repair itself. Below the enamel, you have dentin which is composed of several microscopic tubules (think tiny tunnels) and minerals. Although it is made up of minerals like enamel, dentin is nine times softer than enamel. When your tooth’s enamel gets damaged, your dentin is exposed, causing sensitivity. This sensitivity is a result of stimulants traveling through the tiny tunnels directly to the center of your tooth. At the very core of your tooth is pulp which is made up of nerve tissue and blood vessels. While enamel and dentin are known as hard tissues, meaning they are calcified, pulp is the only part of your tooth that is considered a soft tissue. Pulp is the softest layer of your tooth and is significantly softer than the other layers. Another important part of your tooth’s anatomy is the gum line. The gum line is simply the area where the tooth meets the gum and it distinguishes the crown from the root. 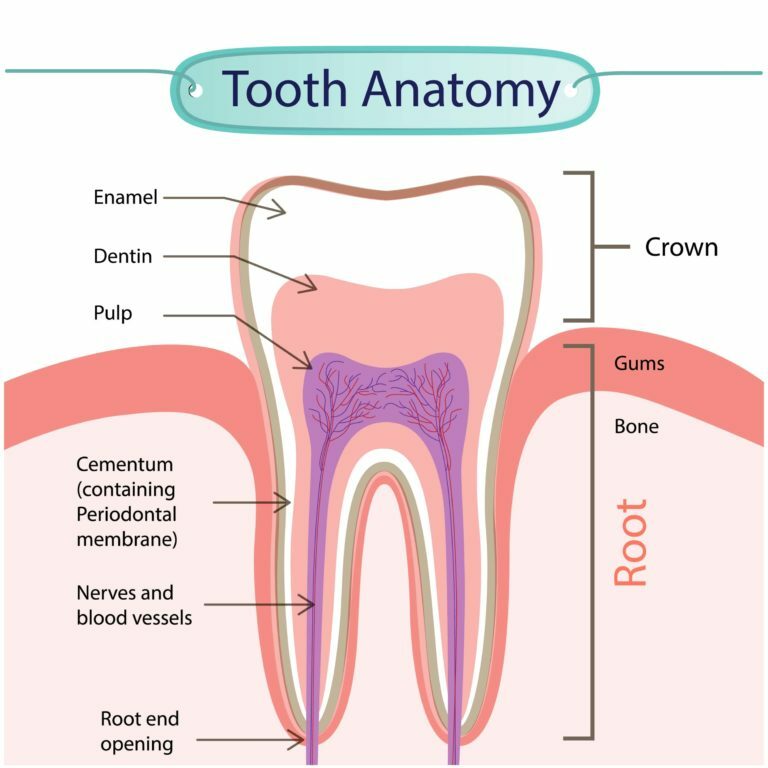 The area where the crown and the root meet on the gum line is called the neck of your tooth. It is important to note this area as it becomes a common site for plaque build-up which can cause gum disease and gingivitis. The part of your tooth that resides below the gumline is called its root. The root is not visible, yet it comprises two-thirds of your teeth’s overall mass. The root is aptly named as its primary function is to act as a “root” keeping your teeth in place. The root of your tooth is covered in something called cementum, which is hard connective tissue that connects the root to the periodontal ligament. The periodontal ligament is responsible for holding the root firmly in the socket of the alveolar (jaw) bone. In knowing the various parts of your teeth’s anatomy, as well as understanding their basic functions and relationships to one another, you will be able to take better care of your teeth. Although your teeth may look simple, their anatomy proves that there is more than what meets the eye.